Many stitchers have expressed a desire to work several designs, and these packs attempt to offer that option at a reduced price. Each pack contains the materials for all the designs shown on the pack front, plus a needle, thread card, envelopes, charts and instructions. Most of these designs are not available separately. Here are three floral cards worked on white perforated paper. 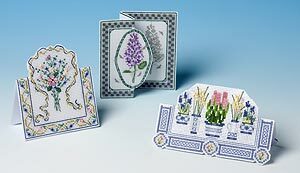 Left to right the designs are named Rococo Flowers, Shadow and Substance and Spring Flowers, and sizes range from 8 to 10.7 cms.